For years our wireless mics have been stored in hanging clear shoe storage bags in our wireless cabinets. It was not a pretty system but for years it was functional...up until a few weekends ago when two wireless mics fell out of the aging containers because the plastic bag had stretched. At that point, I couldn't take it anymore. I and a few of our stage team members started brainstorming on a new storage system. 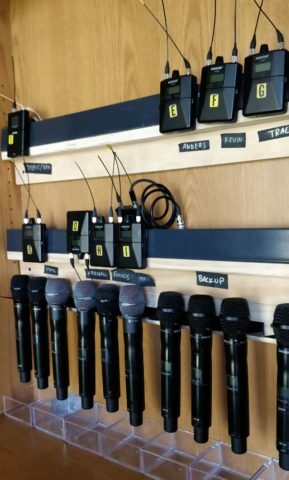 We decided that vertical storage would be best - but weren’t sure how best to mount the mics. A few napkin sketches later, I went to our scene shop and started cutting out a prototype out of ¾” plywood. 45 minutes later, I had a working bracket with a couple of slots. It worked ok but it felt too thick and I wasn’t happy with the asymmetry of the hand cut slots. At this point, I realized - despite my father's best attempts to teach me how to be a competent woodworker - I was probably not going to be able to craft exactly what I wanted with the accuracy I would be happy with using wood as my material. But then I thought - how can I work smarter, not harder? I can make a 3D model and print what I want and it will be precise. I grabbed my laptop and fired up tinkercad to make a simple model based on the wooden bracket I originally sketched. 20 minutes later I was putting the SD card in the 3D printer and starting the prototype. After a 45 minute wait, I had my first prototype bracket. Overall, the prototype was functional. It needed a few modifications to add rigidity and support, but that was about it. My final design holds 3 mics per bracket. I printed out 4 of them to fit all of our mics. I then cut a chunk of pine, sanded it down and nicely rounded all the corners. I pre-drilled some pilot holes, attached everything to the plate, then attached the plate inside the cabinet. Dan Smith, one of our audio engineers, then found some scrap plastic corner pieces in our material stock that perfectly fit the belt clips for our in ear and mic packs and attached them above the mics. With a couple of hours of work and about 11 hours of total print time, we had a much safer, cleaner, and more organized storage system that also takes up a lot less space. This isn’t the end of this project, though. The mic cabinet still needs some work on the labeling system and a fresh coat of paint. One of our stage team members has been working on a project to have a Raspberry Pi display battery levels and mic status with digital LEDs. Here is a link to the OBJ if you want to edit the bracket for your own use. Here is a link to the .stl if you want to either print it yourself or use a site like shapeways to have them printed for you.